V Findlay Wolfe BLOG: Scrap Quilt Secrets: Giveaway! Diane D. Knot's book does not disappoint! Scraps Galore cover all ends of quilty goodness! From patchwork to Appliqué, to Curves, there is so much yummy color to be inspired by! Happily giving you a gift on my Happy Birthday! (while I sleep off my jet lag from just returning from Antarctica!) Photos to come! Leave me a comment about something HAPPY happening today! Good to focus on positive things! Happy Birthday. I was just thinking about what I am going to plant in my vegetable garden this year and how good those home grown tomatoes are. Happy Birthday! Today is the first day of work after easter vacation, and I am happy for that. Happy Birthday! Today involves home baked gluten free brownies, a visit from a friend to stroke fabric, and spending time with my girl who's home from Uni :) X. Something happy about today ... beside your birthday, and the chance to win this book, i also had a day off work so got to do lots more sewing! A good cup of coffee before work. Would love to win this book. HB girl! Happy Birthday! Yes, I would like to win this Great Book! Have a Happy Birthday! A very early spring with lots of sunshine is making me happy. Have a Happy Birthday! My happiness today - working all day on a new applique motif after spending several frustrating hours on one yesterday! Happy Birthday! I'm hosting my quilt guild tonight so it's sure to be fun! Happy birthday, happy spring, happy travels! What a neat book! Love scraps. the happy smile of my two year old granddaughter, who finds joy is even the little ordinary events of every day. Happy Birthday to you! I A windy day makes me happy so today is going to be a good one. Thanks for the chance to win! Happy Birthday! My granddaughter's birthday was yesterday. My grandchildren make me happy! Happy Birthday! Eat cake first! Rocking my 3 year old grand daughter who is under the weather. Happy Birthday! I'm happy for sunshine and grandmothers (known and unknown) whose UFOs I've inherited. Currently adding borders to Sun-bonnet Sue blocks to make sweet little wall-hangings. I'm so happy my husband is home from a stay in the hospital with a blood infection. Happy to see him home in time for Easter! Happy Birthday! Enjoy your day and thanks for the offer.. I'm happy its stunning out today and I can go put mulch around my 3 ornamental Japanese maples that are starting to leaf out! Happy Birthday! I am happy today to see all of our orchids that are blooming like crazy! Scrappy color everywhere! The sun is coming out and my daffodils are so pretty this year! Happy Birthday! Happy Birthday. I am happy to have time with my family over this past weekend and a trip to Florida to visit with more of my family this Friday. Thanks for the chance at a new book on scraps. Nancy Adams. Happy Birthday---hope you have a great day! I'm happy because the sun is shining after a day of rain, just in time for my morning walk. Happy Birthday! I'm looking forward to a massage today. I'd really love to win your giveaway! Happy Birthday! What is happy going on today? I am alive and awake! Happy Bday! What in the world is there to do/ see in Antartica? Today the sun is shining and my family is happy/ healthy. I am wealthy! Happy Birthday! I would like to win this Great Book! A beautiful sunny spring day working with the new calves in the barnyard and hopefully time for quilting later. Happy Birthday. IF I can get the grocery shopping done this morning then I will have the afternoon to sew. That thought is making me happy today! Happy Birthday! Today the weather forecast is for a very warm sunny day. Perfect weather for walking!!! I woke up to a beautiful sunny spring day and I feel wonderful!! I have been sick for almost two years, but today is a good day!! Happy Birthday Victoria! Of course I always remember my Dad happily on your shared birthday. But for something happy I'm doing today - meeting my EIGHTH grandchild....Enid Rose born yesterday. "Good day sunshine....." ( hear the Beatles singing? )off to walk on the beach. Have a very Happy Birthday and many more happy years. Thanks for the chance to win the scappy book too. Happy Birthday! The sun is shining, the birds are singing - playing outside with my dog. It's really the simple things, isn't it? Happy birthday! I hope to do whatever I want, on my day off! I'm happy because I am finishing a quilt which means I can start a new quilt project. Happy B'Day. Happy birthday! I am happy because I solved a quilt design problem that had been nagging and nagging. I'll have the quilt top finished today. Hooray! Happy Birthday and welcome back from what must have been an amazing trip. My happy day is binding a quilt and attending my local guild meeting. Meeting and talking with quilty people is always fun. Happy the wildfires in Kansas & Oklahoma are almost extinguished! And happy birthday! I love scrappy quilts. Happy Birthday!!!! Happy Birthday, Victoria! I'm running errands today, but, there's not a cloud in the sky. So, it feels great to tie up loose ends on a day like today! Please count me in, I'm determined to win this book! The sun is shining and it looks like spring! BTW, I was in your fabulous city the last five days. I went to B&J fabrics per your blog recommendation. Great tip! We had a great time. Hipo birdy day to you! happy day! Good friend and talented lady figured out what the hell was happening on a tatting move! Happy Birthday! Tomorrow we are moving so today means lots of packing. Picking up a quilt from my long-armer. Happy Birthday. Happy spring day and Happy Birthday too! Hope I can win that great new book! Birthday wishes.......I'm going to see my granddaughter, Ashley, for an hour this morning and take a walk to the library.....snow tomorrow!!! It's snowing so I don't have to feel guilty about sewing and not doing yard work. Happy birthday! We're flying south soon to visit son, DIL, and grandkids in Georgia. Today I'm prepping supplies to make yo-yos with the kids while we're visiting, a very happy task. Happy birthday wishes to you! I'm happy that I will have another UFO checked off the list today. Have a wonderful birthday! Happy birthday! It is a beautiful day here today and I am happy to have some free time to sew today. My son is coming to visit in a few days and I'm so happy! He can rarely get away from his job and studies, so this is a treat. Happy Birthday from this happy sunny morning in SC! 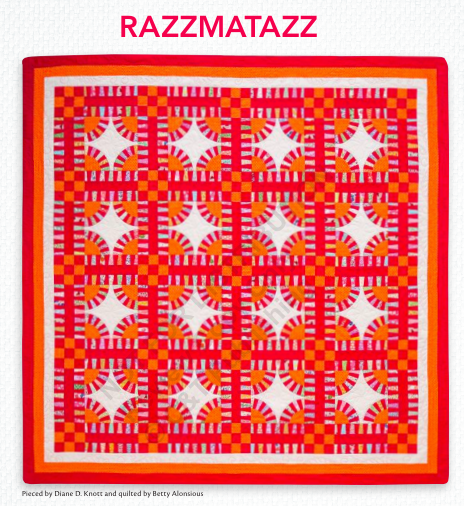 I too love "Razzamatazz"-so bright and Happy! Happy Birthday! Spending a few fun days with my grandchildren! Happy Birthday! I am happy today because I am cleaning out and reorganizing my fabric stash cupboard and finding lots of treasures that I had forgotten I had. More projects on the to do list now but that is always a good thing. Happy Birthday to you! I spend a happy day today with my mom and eating ice cream, yummy! Happy birthday wishes to you, my fellow Aries! I'm spending the day with my five year old granddaughter, who is my little art buddy. There's never enough time for coloring and painting in our world. Hope you have a great birthday! My dad and 2 brothers are coming for a weekend visit, so I am happily cleaning house and menu planning! Happyhappy! I'm happy to sit quietly and read a book today. Happy Bithday! I'm happy to have time to sew today. I'm happy I'll be quilting on my longarm (aka Felicity). Happy BD and many more! Happy Birthday Victoria! I am almost done piecing a quilt for my cat Moldilocks. Fun to work on but hard to tear myself away! My morning yoga class is done and I'm looking forward to working in my studio. Happy Birthday. Sunny blue sky means the little boys and I will be able to play outside today when it warms up a little. HAPPY BIRTHDAY ♥ THANKS FOR SHARING A NEAT GIVEAWAY! HAPPY TO BE ALIVE! I wiah you a happy birthday, Vitoria! I am on spring break which means a day of sewing!! Happy birthday, Victoria. Thank you for the chance to win! Happy Birthday!! Your trip looked amazing! It's a blue sky day today! Daffodils are blooming in the garden. Getting to play in my sewing room tonight will make me happy! this book would also make me happy. I also love Razzmatazz!! Hope I win! Well, your birthday is ONE happy thing -- Have a wonderful Birthday! A happy part of my day is the lovely sunshine, some time this morning with friends, and some time this afternoon to sew. It's all good! 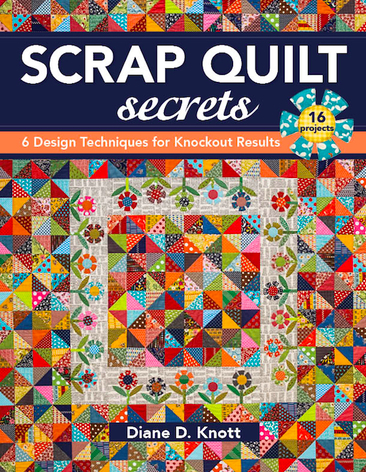 This looks like a great book for a scrap quilt lover like me. Happy Birthday and thanks for hosting this giveaway. I plan to be happy with my scraps today and also to take a walk with my dog enjoying this lovely spring weather. Happy Birthday - what a great way to celebrate - by giving away a gift! My happy thing is that we fertilized our lawn on Saturday and it's been raining and snowing ever since. The grass will green up nicely after this! I love springtime! Happy Birthday! The weather is beautiful, and I'm taking my dog for a walk this afternoon. Then quilting. What could be happier than that? many happy returns! the happiest thing so far today is the beautiful spring weather...60, sunny, breezy and everything in bloom! The weather is gorgeous, I've crossed many tasks off my to-do list today, and I'm almost finished binding my latest quilt. Happy birthday!! Happy Birthday! I love making scrap quilts, as I have a difficult time throwing any leftovers away! My guild loves them too, as most of them are donated through my guild's charity program! Wishing you the happiest of birthdays. I am intrigued by using selvadges. I keep saving them in the hope, that one day, I'll have a brilliant use for them. I've looked on pinterest for some ideas, but they seem too daunting for my skills. Val's quilting studio mentions that selvadges are covered in the book. Can't wait to see what it's all about. In addition to your birthday, a happy thing happening here in Clatskanie, Oregon is that the sun is shining and our chickens are outside, enjoying every bit of it. They know how to soak up a good time. I say a chance to win this book is a happy thing and also it’s stopped raining at my house. Happy Birthday! Sounds like an amazing trip! It is a lovely sunny day and my kids are on vacation from school this week so we are catching up on outdoor play. Would love to see pictures of your trip. My life isn't that exciting. About the only excitement today is that I am going to change the sheets, and vacuum!! Guess it could be worse. It's a sunny, warm Tuesday. That makes me happy. Happy Birthday! I spent some time visiting my favorite quilt shop today and brought home some new fabric. That was a happy event for me. You will be choosing a winner on my birthday. There's bright sunshine today! Thanks for the chance! Have a wonderful birthday 🎂. I get to meet my 7 month old great niece who is arriving from Japan today. Woo hoo! Im happy because my brother and his family are visiting from Denmark. They've never been to see us before, and I'm really happy they finally made the trip. Happy birthday! Well Happy Birthday to you...29? I am happy because we are taking a short trip and I was able to locate my long lost travel dryer today! Happy Birthday to you, Victoria! I am happy today because I'm finally beginning to sew together a top that has been in progress too long. Happy Birthday! I'm on Spring Break from substitute teaching and I am enjoying some inspirational savoring time. I'm catching up on your blog posts and doing some big stitch quilting on a quilt. Happy Birthday. Celebrate in a way that delights you! My happiness today comes from my spotting our rhubarb shoots coming up! Spring WILL eventually get here even though we had flurries on Saturday. Happy Birthday. Mine is coming up in 2 weeks. We had a class today ay our guild called Pine Apple 9 patch, we all had fun, Enjoy your day! Happy Birthday! I am happy today because I was able to volunteer with my friends at Botanica and have lunch afterwards. I officially listed my house for sale today because I am retiring! That's happy indeed! Thanks for the giveaway. Bluebonnets are blooming in Texas! The sun is shining and I'm getting off work early. My niece and family are coming for a sleepover tonight! Happy Birthday! Today I met with my Hospice Quilt Group and that always makes me happy to sew and chat with quilty friends. Thanks for the giveaway! Happy Birthday! My happy thing today has been an evening with my friends - all 3 of us retired teachers and enjoying each others' company just like the old days when we were flat out in front of a class of sixth formers. We even chatted about a quilt that I'll be making for my friend's daughter's 30th birthday! We can't believe we're that grown up!!! Happy, happy birthday, Victoria! And, welcome back to the northern hemisphere! Something happy happening today in our home is the fact that after many years, after many $$$$ and dozens of colors of paint and a few different designers "helping" us, my husband and I have finally found the right color to paint our family room, we found a great designer too! I almost wanted to cry for happy when I saw it on the wall. That room has been depressing for years. It will look like a happy place soon! Yaaaay!! Happy Birthday! Today...it might rain! We can use just a little! Happy Birthday!! Happy that Diane has a wonderful book to share with us!! Happiness is the ice off the lake and docks starting to go in. Summer is on its way. The lake is my happy view out my quilt room window. Thanks for sharing the giving on the day of your birth. The sun is shining here in Washington! Happy that the Spring flowers are bringing color back to our days! Happy Birthday! I'm happy that I tried fmq on my domestic machine. I was making daisy and although they aren't perfect I'm happy with them. I did a totally amazing job on my round for the Cotton Robin! It is incredible and I am stoked. It is such a good feeling when you can create something nobody else has, and you love it! Happy Birthday! My granddaughter called me today. Happy, Happy Birthday!!! What makes me happy all day is seeing a photo of my Grandson wrapped in his colorful quilt, smiling broadly with a twinkle in his bright eyes! Happy Birthday! My happy was the fact that I was able to spend time quilting. 😊 Thanks for the chance to win this great book. Happy birthday to you! You will be choosing the winner on my daughter's ninth birthday. Good things today? School went back in session and I can sew again. Hooray! Happy birthday, Victoria. April 4 is my daughters birthday. I was happy to spend some time with hand appliqué after dinner. Happy Birthday! I'm happily planning our trip to Barcelona at the weekend! Happy Birthday! Today I was happy because the sun was shining and it was warm and beautiful! Happy Birthday!! My Mum is visiting and we're having a ball together, particularly as we bought some fabrics together so I can make her a new lap quilt. All the fragrant roses blooming in my garden make me happy, and tonight is weekly square dance workshop so that makes me even happier! Happy Birthday! My good news is I finished and filed my taxes today, hehe. This sounds like an awesome book and love all the quilts. Happy Birthday and welcome home. I'm happy today because I get to pick up Finn, my 3 yr old granddaughter, from preschool and play with her for the afternoon. Happy birthday. How blessed the world is to have your life as part of ours. Thanks for all your inspiration. On vacation with the family today and that is a Happy day. Happy (belated) Birthday! I'm getting a little work done on a BOM. Thank goodness it is only a 6 month one, because it is intense. I am enjoying it though. Hope your jet lag is over! Happy Birthday! I assume that you're celebrating the whole week! A happy thing that's happening is, my son, dil and granddaughter are coming home after being away for a week! I'm really looking forward to picking them up tonight! just happy to be alive another day, a beautiful spring day! Happy Birthday! It's a gorgeous sunny day here today and that is making me smile. Looking forward to seeing this book on print. My daughter is coming here for dinner tonight after a trip. So happy to see her. And a very happy birthday to you. Happy Birthday! A happy thing today? Bedtime snuggles with my 8 year old :0) thanks for the chance to win this fantastic looking book! Cumpleanos Feliz Victoria! Getting ready to sew a lining into a scrappy knitted tote that my mother-in-law made. I'm happy that she's happy! Happy Birthday, Victoria. I was able to go to a fabric store today so that always brings happiness. Didn't find my missing binding fabric but not the end of the world. Happy birthday and hope you recover soon from the jet lag. Happy day to you! Enjoying beautiful sunny, calm weather today! Can't wait to see your vacation photos. I would love to win! I love scrap quilts and the book looks great! I also love Razzmatazz and Tipsy Tac Toe. I had lunch with a friend and it was great. We talked about all sorts of things and really connected. We have been friends for a long time, but it was as though we were on the same page today. Thank you so much for selecting ME!!! Hope you had a great birthday. Beautiful day here in Nebraska today. Happy Birthday - I was Happy today for sunshine! thanks! Love your blog and your scrap quilts!! Thanks for sharing!! 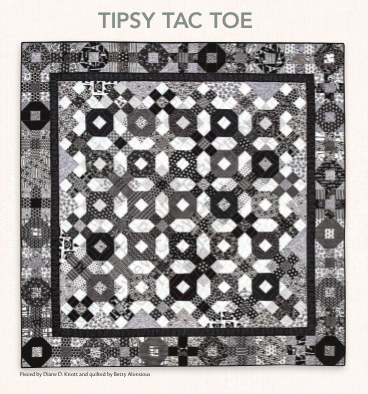 So fun seeing all the fabulous quilts in this new book. Thanks for sharing the oportunity to win a copy. My mom is visiting this week and we're heading to TX to visit my brother. Happy Birthday!! Thanks for giving us all the chance to win this wonderful book. I love scraps!! I'm happy to be preparing for a quilting retreat this weekend! I happily spent the day NOT working because I am off work for the week! My children are teenagers and our time together is going fast......I have a senior and a sophomore. Packing for a trip tomorrow to Winthrop University to drop off my son to spend 2 nights so he can see what that school is like. I will stay by myself in a hotel for 2 nights. Taking my sewing machine, tons of fabric, etc. and I'm going to play! Awesome trip photos! Loved them! Happy Birthday! Returned home from an interstate visit to my grandchildren for Easter. I taught my seven year old granddaughter to EPP and knit during my stay. I am very happy. Fabulous trip photos, wishing you a happy birthday and a great to Australia soon. We are finally getting some sunshine here in Oregon so that's my super happy for the day! March 29th is a popular birthday! I have a daughter-in-law and two granddaughters born on March 29Th. Happy, happy, birthday all around! The new book looks like it is filled with ideas and knowledge. Welcome back! Happy Belated Birthday! It 70 degrees and SUNNY in Seattle!!! Happy Birthday. I hope your day is filled with joy. Today is a glorious spring day & I'm enjoying it. Happy Birthday. I was born on March 29th too! I'm learning to knit and I also ordered some of your acrylic templates. Can't wait to have fun with those. Hi and Happy Birthday! Today is also my grandson's birthday! Hurray! Thanks for the chance to win a copy of this fantastic book! I am happy because I went to my Local quilt shop and 2 of the fabrics that I have been drooling over were on sale for half price! Belated Happy Birthday, Victoria! Welcome back home from your trip. Can't wait to see the rest of your pictures. I am happy because I am alive! Thanks for the opportunity to win such an awesome book! flowers are blooming, we're having a nice spring rain, so I will get to spend time quilting. Today I finally composed a photo album for my daughter in law's birthday ! I'm so happy to have this done. Now onto quilting ! Today is my daughter's birthday! I am happy that she is coming home for a visit soon! Love this book and the blog tour has convinced me that I NEED a copy! Can't wait!